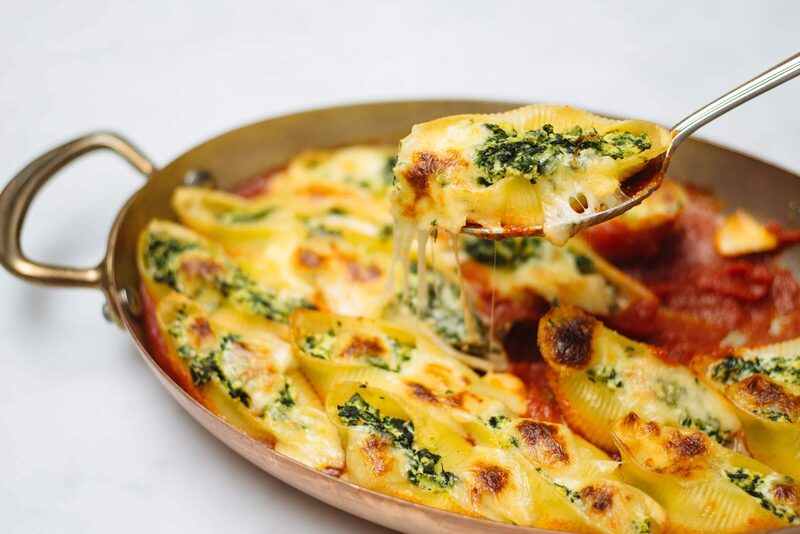 This baked pasta recipe is a huge hit. Baked with creamy fontina cheese and savory prosciutto, it’s the perfect cold night dinner. I actually made this for Clayton’s birthday party the first year we dated. We had a ton of friends over for dinner and people just kept coming back for more. Fortunately, I had doubled the recipe in a large baking dish, and served it with a simple salad. 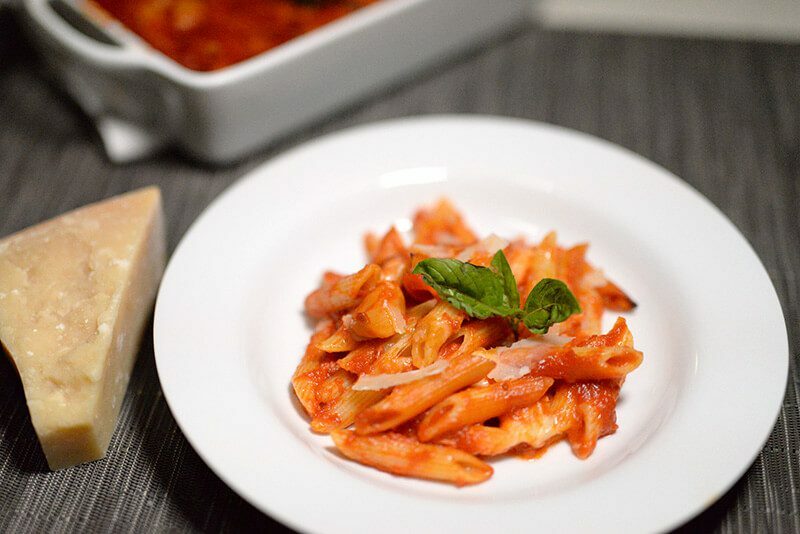 Anyone can make this simple pasta recipe for a party with friends, dinner with family, or date night at home. The leftovers are also delicious! Melt 1 stick (8 tablespoons) of butter in a medium sauce pan. Whisk in flour and begin slowly whisking the milk into the flour a little at a time. Continue to whisk until the sauce is thick enough to coat the back of a spoon. Add the cheese and prosciutto. Season with salt to taste. Bring alarge pot of salted water to a boil. Add the pasta and cook the rigatoni one minute less that directed on the package. Drain and return the pasta back to the pan. Add the sauce to the pan and stir to coat evenly. 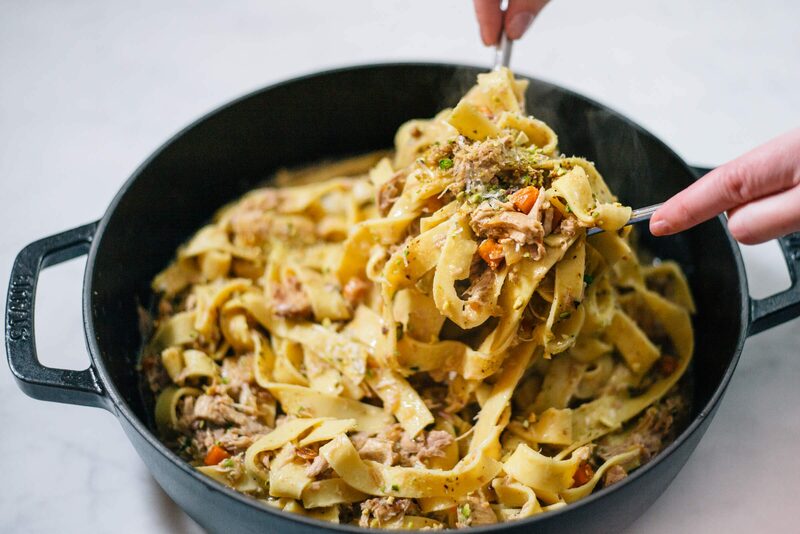 Add pasta to a greased dutch oven or baking dish. Dot the top with the remaining tablespoon of butter. Bake at 425F for 30 minutes or until the top is golden brown.